Eight Nobel laureates have signed a petition calling on Iran to free an imprisoned journalist, said to be close to death after weeks on hunger strike. The petitioners, backed by Paris-based media advocacy group Reporters Without Borders, say they fear Akbar Ganji will die if he is not released soon. 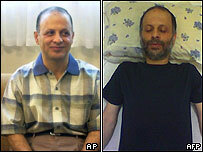 Mr Ganji was jailed for implicating top officials in a series of political assassinations. He has been only drinking tea and water for the past 55 days. Nobel laureate Shirin Ebadi, an Iranian human rights activist and lawyer, launched the petition early in July. A further seven Nobel laureates have signed the open letter to Iranian leaders, calling on them to release Mr Ganji immediately. Among them are John Hume, holder of the 1998 peace prize, and Archbishop Desmond Tutu, holder of the 1984 peace prize. The other laureate signatories are Jody Williams, holder of the 1997 peace prize; Mairead Corrigan Maguire, holder of the 1976 peace prize; Betty Williams, holder of the 1976 peace prize; Maurice Allais, holder of the 1988 Nobel prize for economics; and Georges Charpak, holder of the 1992 Nobel prize for physics. "Iran's most senior officials must heed this very clear message from eight world figures who have made outstanding contributions to peace and science," Reporters Without Borders said in a statement. The Nobel laureates join a growing list of people, including US President George W Bush and former Iranian President Akbar Hashemi Rafsanjani, who have called for Mr Ganji to be released. Earlier this week, the French foreign ministry summoned Iran's top acting diplomat in Paris to urge Tehran to free the reporter. A spokesman for Iran's judiciary has said the only way Mr Ganji could be freed is if he requested a pardon, which so far the writer has refused to do.